Managing greenhouse gas emissions presents a new and fundamental challenge to business. Suddenly in "carbon" (CO2 and CO2-equivalents) we have a new item that every organization must confront. It is a cost, a risk, and perhaps an opportunity. Carbon is everywhere: in the supply chain, in processing and manufacturing, in offices and call centers, in employee work habits and executive travel, and in the packaging and final disposal of products. To reduce global warming, governments are moving to put a price on carbon (via cap-and-trade, taxes or other means.) Leading corporations (like Walmart) are starting to demand that suppliers document the environmental impact and carbon footprint of their products. Legislation now under consideration may soon require carbon documentation for all products sold in Europe. And both consumers and employees want to see companies taking action on climate change. The cost of carbon has nowhere to go but up, and the need to account for and reduce carbon emissions has nowhere to go but up. Are you ready? Carbon management is also an opportunity: Companies that respond most effectively will have a competitive advantage. But gathering the necessary data can become an overwhelming task, particularly when faced with the challenges of diverse geographic locations, complex organizational structures and a variety of utility and carbon sources. The rapidly changing reporting landscape and audit requirements complicate the task. Carbon accounting and management is new challenge requiring new tools. 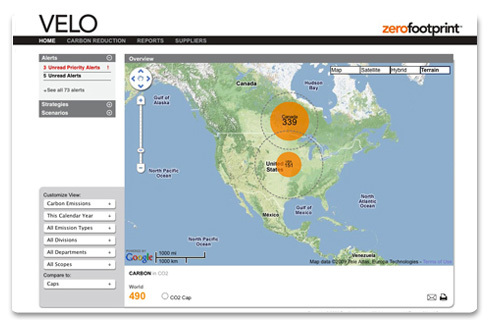 VELO from Zerofootprint is an easily deployed, flexible solution which streamlines carbon emissions management for businesses of any size. VELO automates the measurement, monitoring and modeling of an organization’s carbon emissions to provide a comprehensive, real-time carbon footprint and planning tool. VELO provides the power to model and manage carbon reduction strategies to meet business and compliance requirements. Involve everyone: VELO provides carbon reporting that is exceptionally flexible and easy to use, with attractive, compelling graphical presentation. You can distribute information to motivate action at the employee and first-line manager level, by division, department and specific location. VELO is an important tool to engage the entire organization in carbon reduction and cost reduction. Action is critical as we move into a low carbon world. Greening Point is ready to serve you as a full solutions integrator. We not only provide VELO but we also provide a comprehensive program of configuration, training, deployment and employee/customer communication media. To get started, please contact us today. Research has shown that organizations committed to sustainability have a powerful competitive advantage. Greening Point is also pleased to offer a range of Sustainability Consulting Services and Executive Workshops to help your organization adapt and prosper in the emerging low carbon economy.